These are the legendary Black Hills of South Dakota, an oasis of pine-clad mountains on the Great Plains. The mountains and forests of the Black Hills include a treasury of six national parks. 101 miles of National Scenic Byways. Waterfalls. Watchable wildlife. Acclaimed recreational trails. Trout fishing, Old West landmarks like Deadwood shopping and Wounded Knee. Seventy fun-filled attractions for boys and girls, parents and grandparents. Gaming, spas, golf, fine arts and , too. Badlands National Park is famous for its deep gorges and sharp lunar-like spires. The Crazy Horse Memorial is being carved forever into the Black Hills granite. It's still a secret that the second-longest cave in the world, Jewel Cave, is in the Black Hills. The region enjoys unmatched brand of Old West history, with legendary names like Crazy Horse, Sitting Bull, Red Cloud, General George A. Custer, Wild Bill Hickok, Calamity Jane, Jim Bridger and Jedediah Smith. Let this information-rich website help you plan and book an exciting Black Hills vacation. Plan plenty of time, because you'll discover there is more to do in the Black Hills than you think. It's Beyond All Expectations! Few attractions stir the emotions of visitors the way Mount Rushmore does. Since its completion in 1941, it has joined the Statue of Liberty and the Stars & Stripes as one of America's most inspiring symbols of democracy. The Lakota gave this its name, "mako sica," meaning "land bad." Located in southwestern South Dakota, Badlands National Park consists of 244,000 acres of sharply eroded buttes, pinnacles and spires blended with the largest protected mixed grass prairie in the United States. It is desolation at its truest, where you can look for miles and see no sign of civilization. A unique and striking geologic wonder steeped in Indian legend is a modern day national park and climbers' challenge. Devils Tower sits across the state line in northeast Wyoming. The tower is a solitary, stump-shaped granite formation that looms 1,267 feet above the tree-lined Belle Fourche River Valley, like a skyscraper in the country. 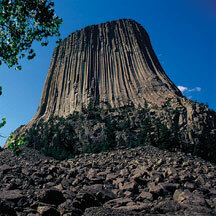 Once hidden below the earth's surface, erosion has stripped away the softer rock layers revealing the Tower. See large herds of buffalo, wild mustangs and burros. The world's largest collection of reptiles. Choose from six theme and amusement parks. Witness the unearthing of prehistoric mammoths and visit dinosaur exhibits. See Old West shootouts. 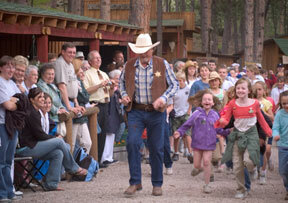 Take in a cowboy supper and music show. Famous indoor and outdoor theaters. Authentic cowboy, pioneer and Native American heritage. Explore a cave, underground gold mine, or view our incredible wonders from a helicopter or a tramway. Here's a surprise for you, something that nobody ever forgets - driving along the endless plains of South Dakota, up ahead you see rising out of the featureless plain, a range of mountains covered in pine trees. These are the legendary Black Hills of South Dakota and Wyoming, and they are full of great scenery and things to do. The Black Hills and Badlands of South Dakota are some of the most popular motor home destinations in the country. It makes a great vacation spot, or stop along your way across the Great Plains to the Rockies and the Great American West beyond. 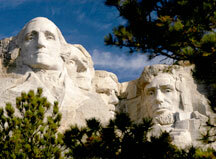 One of the sites that is a must-see in the Black Hills is Mount Rushmore. These masterfully carved faces in the mountain cliffs of our most esteemed former presidents are considered to be a monument to American democracy. We've all seen them in history textbooks and on TV, but there's nothing like actually seeing them "face to face" to appreciate just how giant they are. Another site of important historical significance is the Crazy Horse Memorial. This monument to another of history's heroes includes a museum, shrine and memorial service to the great Sioux leader. It is important to the heritage of all North American Indians, as well as Americans of any ancestry. If you want to get out and really see the majestic preponderance of pine forests up close, there's no better way than the George S. Mickelson Trail. This trail was created in 1998, and winds itself 109 miles through the Black Hills. There are covered bridges, gentle slopes, and beautiful scenery. You can hike it or bike it, and there are lots of trail heads. 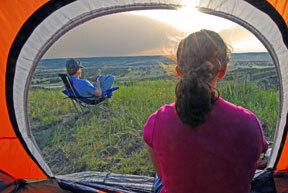 For those who want to get out and see the land in your motor home, the scenic drives of Custer State Park are ideal. There are a variety of roads that take you all over the Black Hills, where you can see its unique scenery and wildlife. Finally, there is Badlands National Park, where you can see buttes and eroded rock formations that tell the ancient pre-history of this remarkable land. Some people have described the Badlands as otherworldly. Looking at some of these rock formations, you can't believe that they were not formed by the hand of man. That is exactly the kind of unique beauty that makes the Badlands such a popular destination for motor home enthusiasts. One of the best places to stay in the Black Hills/Badlands area is Lazy J RV Park and Campground, located just south of Rapid City. It is close enough to the city to be convenient, but outside of town enough that you'll have mountains right at your doorstep. Best of all, it is family friendly and fully equipped for RVs. They also have a variety of activities for folks of any age. Another great place is Beaver Lake Campground in Custer, South Dakota. They have sites for all different sized motor homes, and they are all big and shady. They also have a heated pool and water slide for the kids to enjoy. Rates vary from $23 to $25. If you want to have the Black Hills right at the door of your motor home, try Whispering Pines Campgrounds and Lodging in Rapid City. The campground is located right in between Mt. Rushmore and Deadwood, and the rates are very reasonable, ranging from $16 to $25. They accommodate RVs, campers and tents, and also have cabins for a more luxurious stay.